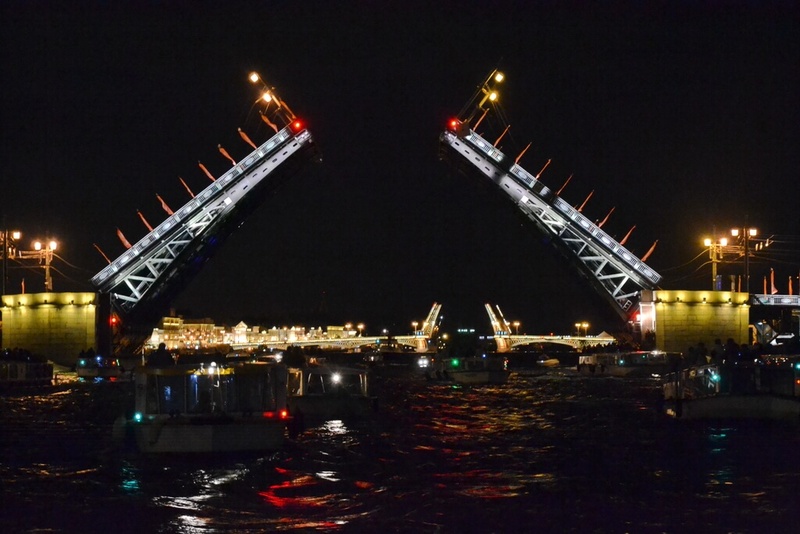 St. Petersburg drawbridges’ opening and closing is a magnificent show, spectacular and captivating. What’s interesting it’s not a tourist attraction, but a purely technological procedure, the fact which adds flavor to the experience. This post is about the best spots to see the best bridges, schedule and tips how to get the most from watching the bridges getting opened and closed. 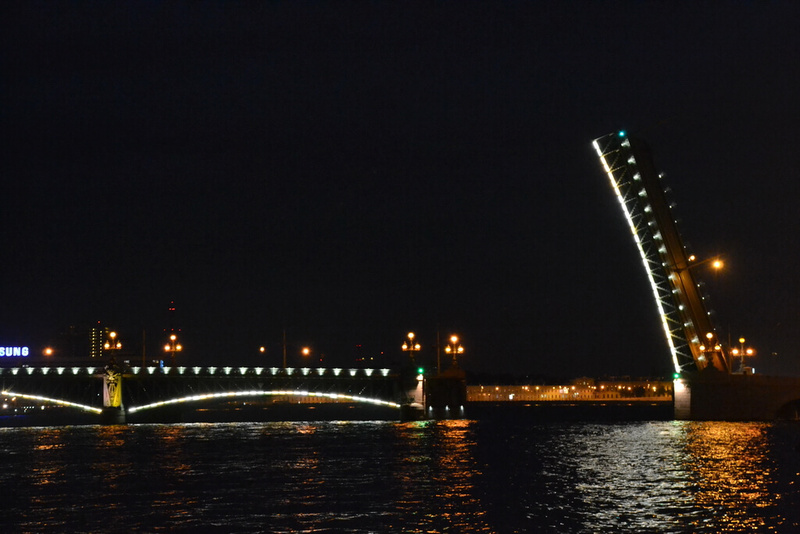 There are 12 bridges in St. Petersburg which can be raised. Nine of them are being raised on a regular basis with the three remaining lifted only upon a special request. These bridges are the only ones of big bridges in the world that are lifted regularly. The only one of this kind except them is the London’s Tower bridge. Many think that the bridges are raised solely to entertain tourists. That’s not so. Moreover, it has nothing to do with tourism. The only purpose of the procedure is to let through cargo river ships going along the Neva river to the Gulf of Finland and in the opposite direction. The Neva river is the last stretch of the Volga-Baltic canal built during the Soviet era for passing river ships from the middle Russia on their way to European ports. That’s why all the bridges are opened strictly at the times set by authorities. The procedure is conducted once or (for some bridges) twice a night: after the first opening a closing follows to let cars through the bridge, and then the second opening-closing iteration is conducted. Here is one important moment: as an opening of a bridge is needed only for passing ships, a bridge may be closed earlier than scheduled (after the final vessel has come through), and the second iteration may be cancelled. • The celebration of the St. Petersburg’s Day on May 27 (the date of the celebration may vary in case May 27 falls on a workday). • The Scarlet Sails festival when all graduates from schools celebrate their ending of school years all night. In 2019, it falls on June 21-22. • In the upper slider, find the Palace bridge and see its current schedule as in 90% you’ll visit this bridge. If you happen to visit another bridge, than slide to find it. 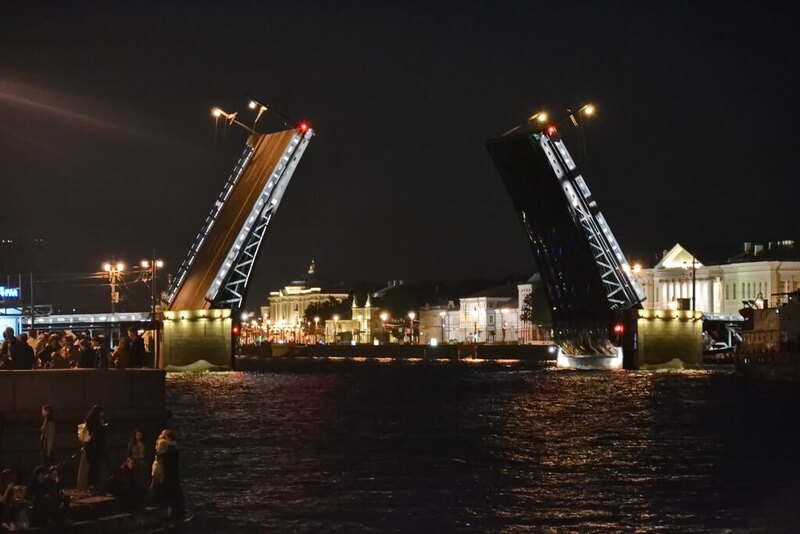 It means that the bridge will be lifted from 1.10 till 2.50, then it will be closed for 20 minutes, and then at 3.10 it will be raised again till 4.55 (or a bit shorter if a final ship passes through earlier). You can also download a special app which shows the current schedule and the current state of bridges. 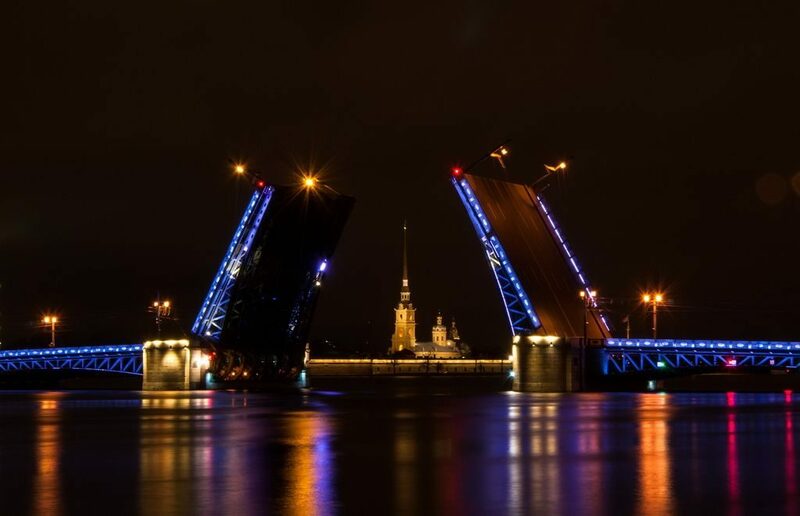 The Sampsonievsky, Grenadersky and Kantemirosvksy bridges are raised from 01.30 to 04.30 upon special request submitted two days before the lift. Most visitors flock to the Palace (Dvortsovaya) embankment to see the lift of the Palace bridge and then rapidly run to the Trinity bridge and usually don’t catch it. That’s a bad strategy. We will tell you what’s the best, but first give you all the options available. To better understand them, use the map below. A) That’s what we described above and that’s what almost all visitors do standing on the Palace embankment or the Admiralty (Admiralteyskaya) embankment close to the Palace bridge. The spots are 1 and 2 on our map. B) The same approach, but this time with the Trinity bridge. First, you see the Palace bridge from distance of about 1 km, then you watch the Trinity closely. The spot is 5. C) From two spots between the Palace and the Trinity bridges. Spot are 3 and 4. Read further for more details. D) Watching the Palace bridge closely, but from the opposite shore, from the University embankment or the Spit of the Vasilievsky island. Spots are 6 and 7. E) From a boat during a boat trip under the drawbridges. F) From a … roof. That’s what indicated as spots 1 and 2 on our map. Look, the bridge is raised at 01.10. The closeness gives some advantages, you can take nice photos, etc., but taking a front row seat is difficult as the site gets overcrowded about an hour before the start of the show, so most people try to become a giraffe to see something. If you are 190 cm (6.2 feet) high, then it’s OK. But with 170 cm (5.5 feet) it’s difficult to enjoy with the view. Further, most people want to see the Trinity raised, bit its lift starts only 10 minutes later. No chance, sorry. The distance between the bridges is 1.24 km (nearly 4,000 feet), so getting there in two or five minutes is impossible. We checked this scheme out personally and were left unsatisfied. Seeing the Trinity from a big distance gives no joy. When var A is good? On a rainy day when a crowd is not that big. Or if you are tall. Or if you’re ready to arrive on the scene one hour before the show starts to secure first row spots. Spot is 5 on the map. Here the level of competition for the best view spots is low as this bridge is less popular than the Palace one. What’s good is that you can first see the Palace bridge lifted, but from 1 km (3,280 feet) distance. But the Trinity bridge belongs to you entirely. On our map, these figures are 3 and 4. We have calculated and tested personally the point between the two most popular bridges, from which the both are seen well enough. These are spots on the Palace embankment just opposite the building №26 and the building №18. 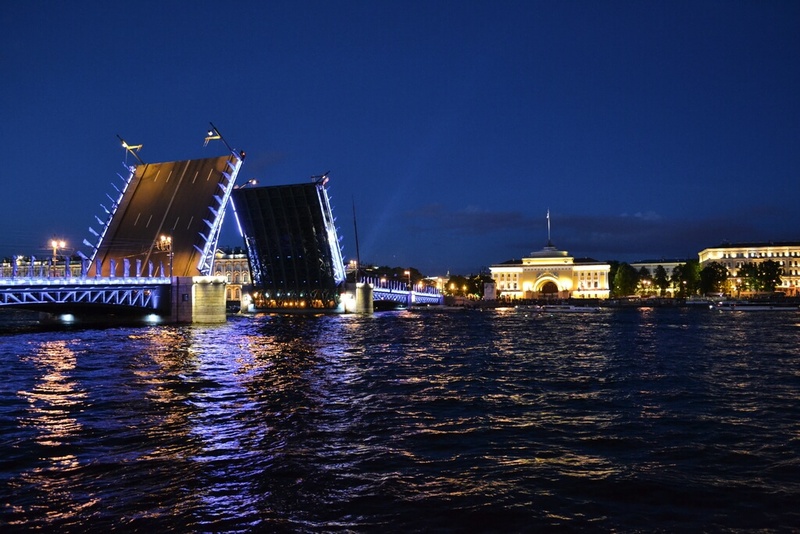 The Trinity bridge looks like that (the photo was taken from the point opposite the building №18, to which we advanced after seeing the Palace bridge raised). The only minus here is that you’ll not be able to feel the desire of the crowd and its collective “wow”. But you may not need it at all. Spots are 6 and 7. You stand at any point on the University embankment or on the Spit of the Vasilievsky island. No crowd here, but you will have to stay on the island for nearly two hours in case your hotel isn’t on the island. Ups. That’s the best option if your hotel or an apartment is located here or you came on a cruise vessel docked at the Sea Facade. Of course, there are other ways to get from here to the city center except the bridge, but it takes rather much time anyway and is rather costly if you hail a taxi. When going on tour on a boat, you get impressions of absolutely other kind than from ground. Night water drawbridge tours let you see a few bridges during one trip. If you lucky enough, your vessel sails under a bridge just at the moment of the lift. It’s rather difficult to shoot good pictures as you’re constantly rocking on the waves. And it’s rather cold on the water. But these two obstacles are tiny in comparison to the experience you get. Night water excursions costs a bit higher than in the daytime and they’re a bit longer. In 2018, they cost 800 – 1500 rubles depending on the type of a vessel, the duration of an excursion and the services and entertainments provided. Important: when purchasing such an excursion online, choose the date after 00.00. If you go at night from June 24 to June 25, then choose June 25 when booking. That’s unarguably the most romantic to see the bridges lifting. Some guides can get you a spot on a roof overlooking the aquatorium of the Neva river, the Spit of the Vasilievsky island, the Peter and Paul fortress and the bridges. There are a few roofs on the different shores of the river so that tourists don’t feel inconveniences when getting home. For a group of 2-8 persons, a ticket costs 1100 rubles per person. An exclusive tour costs 3500 rubles. All the roofs are not official view platforms, but safe. We’d like to share several obvious, but nonetheless important recommendations, if you’re going to see the bridges’ show. 1. Take your warm clothes with you, even if the daytime weather is hot and sunny. 2. Beware of pickpockets, especially at the most dramatic moments when you’re fully into the show. 3. 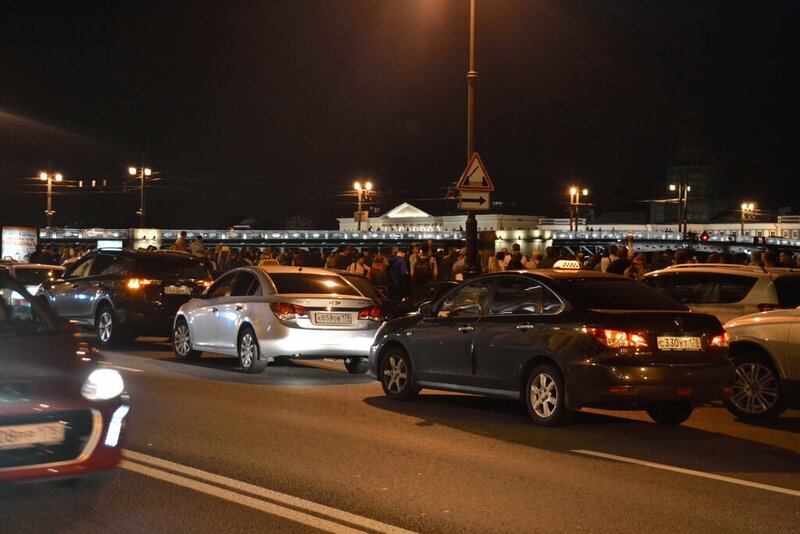 There are a lot of taxi drivers offering their services to visitors right near the embankments. It’s better to order taxi by call or via an app, but not hail it in the street. Remember, St. Petersburg has no its municipal taxi like New York or Beijing. Sometimes passengers pay ridiculously exaggerated fares. 4. Taking some food and hot drinks with you would be useful.